Professional Grade Video surveillance is no longer just for commercial or industrial applications. With increasing crime and theft, home and small businesses have increased need for quality video surveillance. While intruders get discouraged with just the sight of a security camera, a quality security camera system can help you ensure the safety of workers and family members as well. Whatever your surveillance need be, REVO is one brand that has it all. REVO is breaking barriers once again with its new Ultra Series surveillance systems. With the highest camera resolutions, camera cable length of up to an incredible 500ft, and the easiest and most reliable networking/remote viewing on the market, the Revo Ultra HD Security System is the best we’ve ever offered. 300% Longer Max Cable Length – Cable runs of up to 500ft, 3x longer than typical 100m max. Revo Ultra HD Camera Systems take high resolution one step further with IP (Internet Protocol) Technology. The standard HD 1080p resolution is doubled with 4 MP sensors; optical grade IR optimized glass and 3D Digital Noise Reduction. Cover more doors, windows, exits, and hallways with camera cable lengths of up to 500ft, 3x longer than the typical 100m max. Never stay in the dark with unmatched Night vision up to an unprecedented 100′ in total darkness. With Smart IR, Ultra HD IP cameras adjust IR Array intensity for just the right amount of IR illumination at any given time. 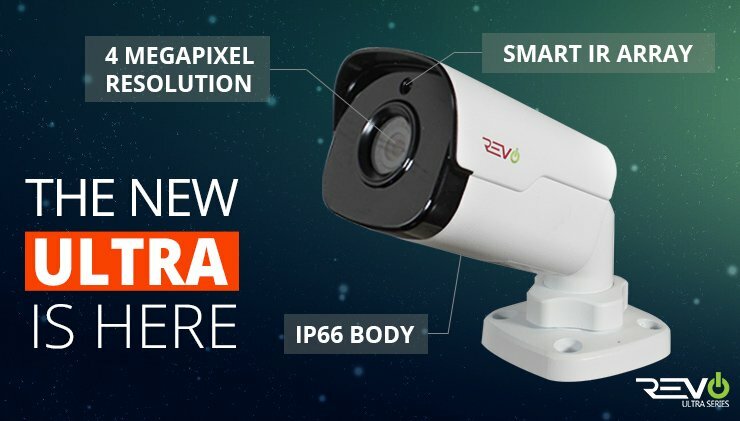 Revo Ultra HD IP security cameras are built for the outdoors, capable of handling temperatures as hot as 140F and as cold as -31F, rain or shine. Setup is a snap with PoE and Cat 5e cable. One cable carries everything — Audio/Video/Power. The polished look and intuitive feel of the Ultra’s interface is a joy to everyday use. Whether you’re using the NVR itself, the Mobile App, Computer Software or Browser, Viewing, Recording, Playback is instantly accessible. Corridor View Mode for monitoring doors and hallways. Revo Ultra takes advantage of powerful connectivity tools to truly take the “work” out of “networking”. Revo Ultra Mobile App for remote viewing all your cameras from iPhone and Android, all in wonderfully detailed HD. Two-Step-Setup — Make an account, scan the NVR QR code and start monitoring all your Ultra HD Security cameras! Ultra Remote for viewing multiple Revo Ultra units at different locations from a single computer. Access your Ultra NVR via the web using myrevocloud.com (compatible with Internet Explorer). Update the NVR’s firmware directly from the internet. Fast and convenient Video export/backup via USB 3.0. The system tracks its own health and alerts the user of any malfunction. Pre-event recording feature starts recording or trigger sensors before motion is detected. It provides valuable context leading up to the incident. 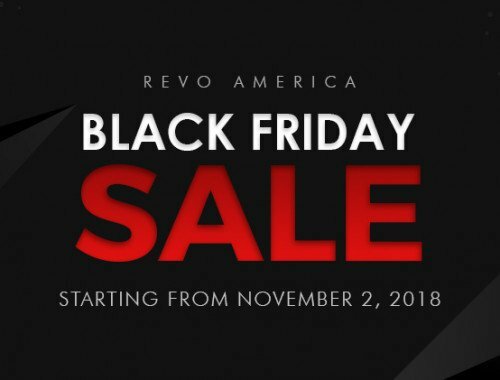 Revo America ‘Black Friday’ Sale Begins NOW!